Ok sir, I respect your decision, therefore, I think in an investigation work, as you do, it´s important to have proves, and going to Houston was for you the opportunity to see what we do, and tell your public with proves what we do, as a good investigator, cos until now all what you say it´s according to what you think and according to companies who didn´t trust us in a first place, but as you know, trust is really hard to get nowadays, don’t you think? 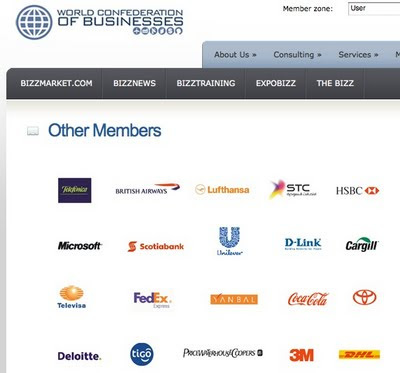 Then, if you remember, when I sent you information, there was a list of member companies of last years. I think the information was transparent, but why can´t you just contact them? Finally, the real doubt you have about us is the selection process, but what about all the benefits we provide? I mean everything is negative in your blog when you talk about us. You actually kind of hide what we do avoiding talking about the benefits that we provide. Doing this is pretty close to defamation, right? I mean there´s so much injustice in the world, so why don´t you focus on them to really help people? Especially from your country. You know, you make me think of the police when they arrest you for nothing, and when you need them they´re never around. Well, i´m sorry to see that you don’t give me the chance to talk to you, it´s like you´re the judge and im the guilty one who can´t say a word cos you closed the case, this is a king of injustice, don’t you think? Well, thank you anyway, I learn everyday, like now thanks to you, people who pretend to defend injustice are sometimes themselves part of it. Thanks for calling over the last couple of days to talk further about the Bizz Awards and your response to our coverage. Unfortunately I remain unconvinced that I am wrong about the nature of the Bizz Awards. As far as I can tell, and you haven't given me any evidence to the contrary, these "awards" are not genuine. They are not based on any true assessment of the companies in question prior to their notification. They appear not to be based on any objective criteria. They genuinely seem to be nothing more than awards that companies pay to receive. I am not the only person who feels this way and despite the attendance each year of a number of paying companies and despite the existence of the "award" scheme for a few years, I find your critics more persuasive than people self-justifying their payments for attendance at an award ceremony. I'm also concerned at your attempt to reward me if I stopped criticising the Bizz Awards and removed my comments from the Consumer Watchdog blog. Your offer of international flights from Botswana to Texas, accommodation and entertainment as well as attendance at the Bizz Awards 2009 ceremony in Houston, Texas in return for removing all my commentary about the awards was, I believe, an attempt to bribe me into silence. I will, of course, NOT be accepting your offer. It’s been a mixed bag this week. A week of frustrations, successes and did I mention frustrations? Let’s start with some bad news. We got a phone call, an abusive one unfortunately. A consumer called in to insult us. She was very upset because we hadn’t responded to an email she sent us some while ago. She referred to us as a bunch of clowns (I’m not sure I like that, I know I’m not the only one who thinks clowns are creepy, not funny) and accused us of being “a joke” and less use than the Consumer Protection Unit. Now that IS funny! Well, here’s the problem. I did think of typing this in capital letters to get the message across clearly. I did think of writing it in italics or bold text so it’s easy to understand. Instead I’ll say this very calmly. We never got your email. Not ever. So please don’t shout at us because we didn’t respond. Perhaps you should have sent it again if you didn’t hear from us? Perhaps, more importantly, you can behave with a little courtesy? Perhaps, finally, you can print out your email and either fax it to us, or if you are still unhappy with the Consumer Watchdog bunch of clowns, you can put it somewhere where the sun doesn’t shine. See, I told you I know everything about customer service, I do honestly. Now for some good news. Yes, really good news. For two long years we’ve been urging stores that sell on credit to obey the law. Yes, I know it’s asking a lot, it’s a bit like asking combi drivers not to be homicidal maniacs but I’m naturally an optimist. However, most stores have responded positively and have changed the way they advertise things on credit. The thing the others fail to do is disclose the total cost of an item when they advertise that you can buy it on credit. That’s all we’re asking for, that’s not too much to ask, is it? OK, it took a while but I always promised them this: that we would celebrate them for doing the right thing, no matter how long it took. Let’s all visit Game on the 27th November and check it out. That just leaves Supreme and Furnmart who appear to have decided that Botswana law doesn’t apply to them. Do you think they’ll ever decide to abide by the law? Then there were the disappointments. Curious disappointments but they weren’t what I hoped for. Some weeks ago I described the so-called “University of SouthCentral Los Angeles” as a “bunch of crooks” and suggested that their educational qualities were roughly equivalent to those of my toilet. I said all of this because this “university” that is based in the British Virgin Islands and not, in fact, in LA, offers a variety of degrees for nothing more than money. $850 to be precise. When we stopped laughing at the irony of being threatened with a defamation suit by a diploma mill we wrote back and told them that we thought they were silly and that they should go away. Then they went quiet! I was so looking forward to a fight with some crooks. It’s one of my favourite pastimes. OK, I considered it. They’re still there. The Bizz Awards remains a worthless, fake award exercise. All our comments remain on our web site and on the blog. Thabo at Optical Centre for thoughtful, informed and friendly service. Portia from FNB Main Branch for “fantastic follow up” with a customer and for being pleasant, helpful and very pro-active. Game stores for promising to advertise credit sales in the legal way. I would like to take this opportunity to share my experience of poor customer service that I received at Carnival Furniture. I was offered a 3 piece Wembley bedroom suite that comes with a base set as an optional extra on the 29th September 2009. I went to their office to view the set which was in stock at the time. I signed the relevant documents and gave them my confidential information as requested. On the 1st October I gave them a deposit of P400 at their shop and I was told that the items will be delivered to my place. A week I made a follow up and I was told to come to the shop that afternoon. They told me that the Manager said the set is out of stock even though it was there. The price that was used for my purchase had been P1,999 . I accepted what I was told and asked for a refund as I had no interest in any of their other items. The sales person left the shop and I was left behind with the manager. I told him I needed my cash back immediately as it would be difficult to come back at another time. He told me that I will not get my refund as I didn’t have any proof to claim my money but I still have my receipt. Is this the way that customers should be treated? No, no, no, no, NO!!!!!! This is simply unacceptable. This is NOT the way a customer should be treated. You are absolutely, 100% entitled to a refund. Of course the store can have rules about how refunds are given, that’s perfectly reasonable. It might be too much to demand cash back from them if you had paid them the full price, it’s probably reasonable for them not to keep that sort of money on the premises. However you only paid them P400, surely they must have that sort of money available? It’s quite simple. Carnival failed to deliver you the goods you had ordered and for which you had paid a deposit. The deal is therefore over, concluded, finished, completed, DEAD! They have your money and they have no choice but to give it back. We called the branch you visited and spoke to the manager. He claimed to know nothing about the case and promised he’d call us back. Unfortunately he didn’t so we called another branch and asked to speak to the Managing Director. That wasn’t possible so we spoke to the other branch manager. He was very helpful and told us that he thought this was a simple case and the customer should get their deposit back immediately. He said he’d call the first manager and that it should be arranged. However we’ve not heard anything back from anyone yet. We’ll keep you informed!